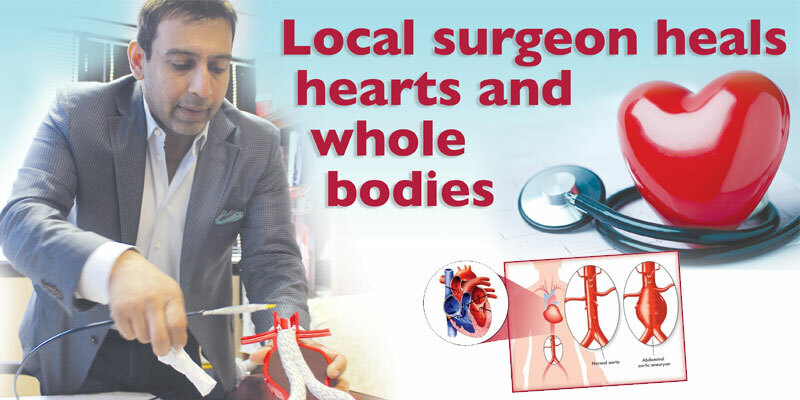 Dr. Samir Germanwala, DO, knows the human heart and all its intricacies as it pumps the blood that supplies oxygen and nutrients to various tissues while removing carbon dioxide and other wastes. This interventional cardiologist’s patients come to him with many heart-related issues, but among the most lethal and common are aneurysms. These are killers that, unlike a rattlesnake, seldom give warning as they menace many, many patients. The full name is Abdominal Aortic Aneurysm (AAA,) and its favorite targets are Caucasian males with such unhealthy habits as smoking and gluttony. In some cases patients are born with aneurysms or may develop them as a result of aortic disease or injury. The condition occurs when sections of artery walls weaken, causing them to widen abnormally or balloon outward. High blood pressure is another leading cause. According to American Heart Association, an AAA rupturing is such a serious medical event that only about 20% of its patients survive. Extreme stomach and/or back pain that will not go away is a sign of AAA. Call 911 and seek immediate medical attention. When doctors detect AAA symptoms they may arrange for testing to confirm this diagnosis. These tests typically consist of imaging the abdomen using magnetic resonance imaging (MRI,) computerized tomography (CT) and ultrasound imaging. These procedures enable physicians to essentially “see” into the aorta and other blood vessels and organs to detect the possible presence of an aortic aneurysm. Taking into account that the aorta runs from the heart all the way to the abdomen, an AAA can weaken this largest blood vessel in the human body, becoming fatal if the aorta ruptures, thereby causing massive internal bleeding. Endovascular stent grafting (also called endovascular aneurysm repair or EVAR) is a recently introduced treatment which is less invasive than traditional, open surgery. It involves inserting an endovascular stent graft to reinforce the aortic walls, thus saving the aortic wall from rupturing. Em-placing the stent is done by using a long, very thin and pliable plastic tube called a delivery catheter to insert the stent graft into the aortic aneurysm. The stent is inserted into an artery in the upper leg or groin and guided to the area of the AAA. When the stent graft is properly positioned, the surgeon fastens it into place and gently removes the delivery catheter. Although both endovascular stent grafting and open surgery are used to produce the same results, the endovascular stent graft is em-placed without the removal of any tissue from the aorta, and therefore does not require open-chest or open-abdominal surgery. Since it is so much less invasive than open surgery, this procedure requires considerably less recovery time. Typically, patients return home in less than a week, and can return to work in four to six weeks.